» How Many Times a Day Should I Feed my Dog? 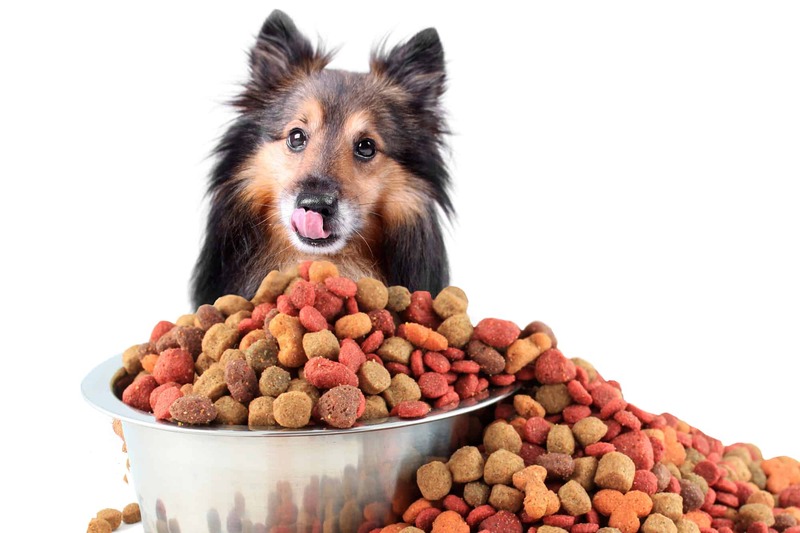 Owners — especially new owners — often wonder how often they should feed their dog. Unfortunately, there’s not a one-size-fits-all answer to this question, as the best dog feeding schedule varies from one dog to the next. However, we’ll provide a few general recommendations and explain some of the most important factors to consider when determining how many times a day your dog should eat. Generally speaking, most dogs should be fed between one and three times each day. However, there are a number of exceptions, and you’ll need to consider a variety of factors when trying to determine the optimal feeding schedule for your pet. Simply put, puppies and younger dogs require more frequent meals than older dogs do. Puppies should typically be fed three to four times each day, or about once every three to five hours. On the other hand, adult dogs will usually thrive on a twice-daily feeding schedule, with the meals spaced about 8 to 12 hours apart. 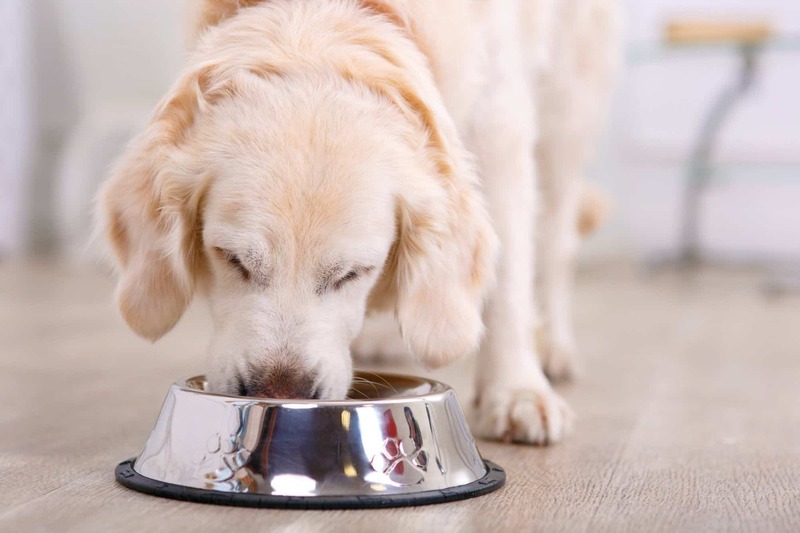 Some owners feed adult dogs once per day, but this may cause your dog to become quite hungry between meals, and it can be challenging for some dogs to ingest their entire daily food allotment in a single meal. Most senior dogs will thrive best on a twice-daily feeding schedule. 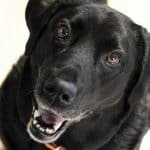 Healthy adult dogs will generally adjust to a twice-daily feeding schedule, but you may need to alter this to accommodate any health concerns your dog has. For example, diabetic dogs may require strict feeding schedules that require multiple, smaller meals each day, and dogs who’ve experienced bloat (as well as those who are predisposed to the condition) should also be fed very small meals spread throughout the day. Similarly, if your dog needs medications that should be taken with food, you may have to alter his feeding schedule so that it matches up with his dosing schedule. A number of other health problems, including bilious vomiting syndrome — a condition in which dogs routinely vomit stomach acid — may also require you to feed your dog several small meals each day, rather than one or two large meals. Just be sure to discuss your dog’s feeding schedule with your vet if your pet suffers from any serious health problems. 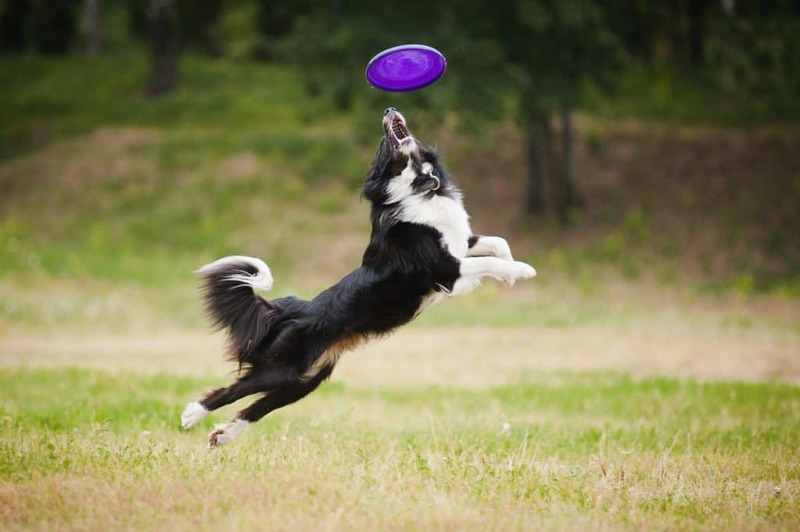 Your dog’s food obviously provides him with the energy necessary to run, jump and play, so you’ll need to factor in his activity level when determining a proper feeding schedule. In most cases, highly active breeds and individuals will require more food than sedentary dogs, and they’ll need to have the chance to eat more often than their sedentary counterparts as well. This is especially true for working, hunting, tracking and competing dogs, but even typical pets may exhibit high activity levels that require adjustments to their feeding schedule. Generally speaking, you’ll want to feed highly active dogs at least twice per day, and some may require three meals every 24 hours. If your dog’s body weight is outside of the typical range for the breed, you may need to alter his feeding schedule. For example, you’ll often find it necessary to reduce the amount of food provided to overweight dogs in an effort to help them lose weight. But, because you don’t want your pet walking around in a famished state all day, you’ll want to offer smaller, more frequent meals. So, dogs who are trying to lose weight will often require three meals each day. On the other hand, dogs who need to gain weight are usually encouraged to eat more food than normal. One of the best ways to do so is to implement an ad libitum — also known as free-choice — feeding schedule. To do this, you’ll simply fill a bowl to the brim with dog food, and allow him to eat at his leisure. Just be sure that you still wash your dog’s food bowl regularly — don’t just keep adding new food to the bowl each day. It is also important to factor in your work or school schedule when determining the optimal feeding schedule — it’s hard to feed your dog when you’re not home. Most owners will find it possible to simply feed their dog in the morning before leaving, and then once again upon returning home. However, if you have a mid-day break that allows you to drop by your house, you may be able to implement a thrice-daily feeding schedule, if that’s more suitable for your pet. It’s also important to consider your dog’s typical day when deciding on a feeding schedule. For example, if you take your dog to play fetch at the park every morning, you’ll want to make sure that you don’t feed your dog right before heading out the front door. But, you also want to make sure your dog isn’t forced to remain hungry for hours upon returning. In such cases, you’ll probably want to be sure to feed your pet at least one to two hours before your typical trip to the park. How Much Food Does Your Dog Need Each Day? When determining the proper feeding schedule for your dog, you’ll also need to be sure that you are providing your pet with the right quantity of food. Otherwise, you may prevent your dog from ingesting enough calories, or, conversely, you may provide him with too much food, which can cause him to gain weight unnecessarily. The best way to determine the number of daily calories your dog needs is by consulting your vet. Only your vet can factor in the myriad factors that go into determining the ideal amount of food your dog needs. Weigh your dog. Use kilograms if possible, but if you must weigh him in pounds, divide the result by 2.2 to obtain his weight in kilograms. The resulting number is your dog’s resting energy requirements (RER). This is the number of calories your dog needs to keep his lungs inflating and heart beating — it does not include the energy your dog needs to remain active, nor does it provide enough to fuel growth or reproduction. To account for these energy demands, you’ll need to determine your dog’s maintenance energy requirement (MER). Your pet’s MER represents his total caloric needs. After multiplying your dog’s MER by the correct value from the chart above, you’ll be left with an approximation of your dog’s daily caloric needs. You’ll then need to check the label on your dog’s food to see how many calories are in each cup. Typical dog foods have between 250 and 500 calories per cup. So, if you have a 90-pound Golden Retriever, you know that he weighs 41 kilograms. The RER of a 41-kilogram dog is about 1358 calories. Assuming that he is neutered, his MER will be 2150 Calories. If his dog food contains 400 calories per cup, he’ll need approximately 5 1/3 cups of dog food each day. Accordingly, if you want to feed him twice a day, each meal should be a little more than 2 cups. As mentioned above, it can be tricky to feed your dog several times per day if you spend long periods of time away from home. Unless you are implementing a free-choice feeding protocol, you don’t want to simply leave a bowl of food out all the time — this may cause dogs to gain weight. And, if you don’t do so carefully, you may end up attracting bugs and rodents by leaving a bowl of food out at all times. However, there is a solution: You can simply use an automated dog feeder. Automated dog feeders provide your dog to a predetermined amount of food at predetermined times. Many even emit an audible tone at feeding times, so that your dog knows when dinner is served. We’ve written about automatic dog feeders before (and we even recommend several of the best options available on the market). Be sure to give that article a glance if you struggle to keep your dog fed while you are away from the home. 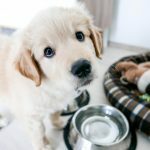 How Can I Tell If I’m Overfeeding My Dog? It’s important to realize that the figures provided above are only approximations. You must be careful to monitor your dog over time (and consult regularly with your vet) to ensure that he is getting the proper amount of food. 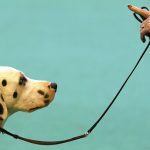 You don’t want him to become overweight, as excess body weight predisposes dogs to a number of health problems. If you note any of these symptoms, contact your vet and inquire about reducing the amount of food provided. How Can I Tell If I’m Underfeeding My Dog? Just as it is important to avoid overfeeding your dog, you must be sure to avoid underfeeding your dog too — you don’t want your pet walking around hungry all the time. 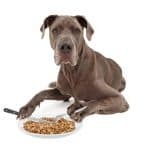 While it is clearly important to feed your dog an appropriate amount of food and, as we’ve primarily discussed here, to provide this food on a reasonable schedule, it is also critical that you provide your dog with a nutritious and safe food. So, be sure to check out our review of the best dog foods for large breeds. 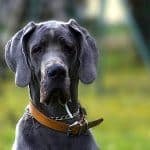 There, we not only provide recommendations for the best options for large-dog owners, but we also explain some of the most important things you need to consider when picking a dog food. 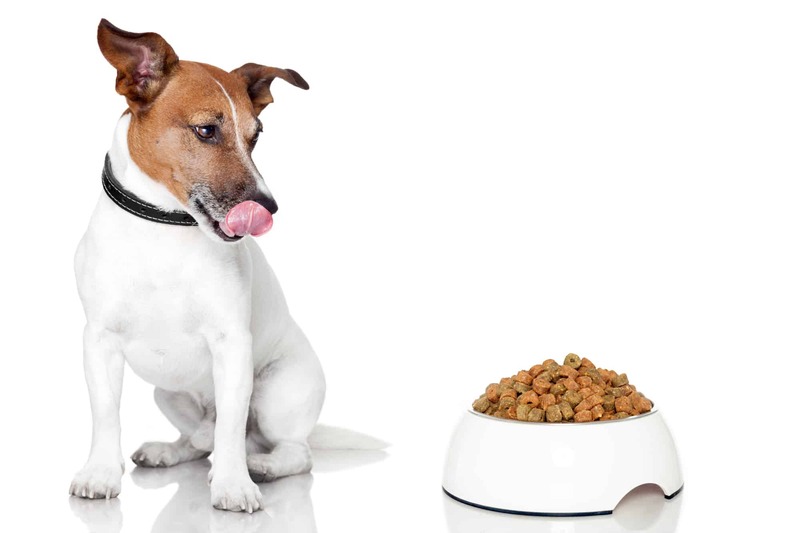 Raw vs Kibble: Which Dog Food Diet is Best?